Isn’t Friday your favorite day of the week? For most OnLive gamers, it certainly has become so, with the addition of $5.00 Fridays a few months back. This Friday, like every other Friday, OnLive is offering a different game for only $5.00. On top of this, PlayPack subscribers who pay $9.99/month for unlimited access to over 80 different games, can take any additional 30% off this already discounted price. This reduces the price to a mere $3.50. This week OnLive is offering one of the most played games on the entire cloud gaming service, Borderlands Game of the Year Edition. This game, is normally priced at $29.99, so this is a phenomenal 83% off for non-PlayPack subscribers, and an even more unbelievable 88% off for PlayPack members. You can not find this game cheaper anywhere. 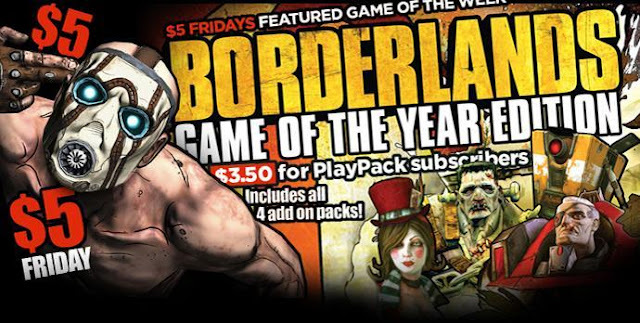 Borderlands GOTY Edition is an RPG shooter from publisher 2K Games. It has received an OnLive user rating of 4.5/5, and has a metascore of 84. Gamers can use either a keyboard and mouse combination or the OnLive GamePad when playing this single/multiplayer game. This OnLive version comes with all four DLC Packs (even though OnLive won’t call it downloadable content, since there is no downloading involved).